The atmosphere for Christmas celebrations this year for Indonesian Christians is unique from a sociopolitical point of view because it takes place as the country is preparing for the 2019 presidential and legislative elections. And so, what can be pondered in such a context in relation to Christmas? Of course, first of all Christmas is a liturgical traditional moment to celebrate the birth of Jesus Christ, the savior of humankind and creation. Jesus is the leader of humanitarian defenders with-out discrimination. 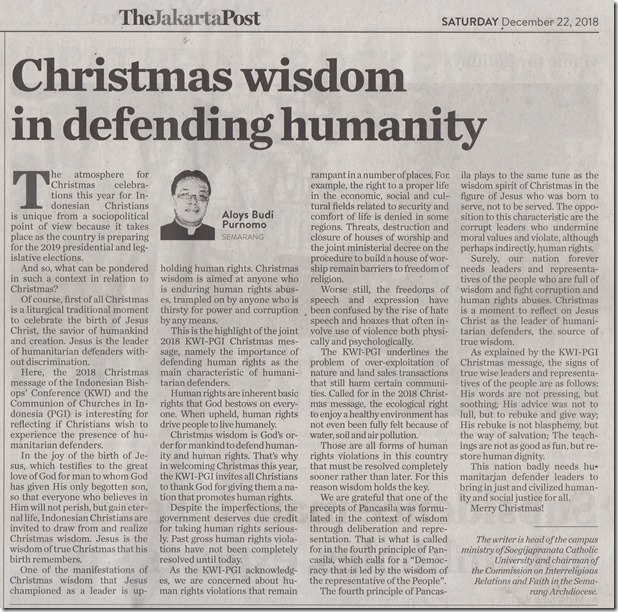 Here, the 2018 Christmas message of the Indonesian Bishops’ Conference (KWI) and the Communion of Churches in Indonesia (PGI) is interesting for reflecting if Christians wish to experience the presence of humanitarian defenders. In the joy of the birth of Jesus, which testifies to the great love of God for man to whom God has given His only begotten son, so that everyone who believes in Him will not perish, but gain eternal life, Indonesian Christians are invited to draw from and realize Christmas wisdom. Jesus is the wisdom of true Christmas that his birth remembers. One of the manifestations of Christmas wisdom that Jesus championed as a leader is upholding human rights. Christmas wisdom is aimed at anyone who is enduring human rights abuses, trampled on by anyone who is thirsty for power and corruption by any means. This is the highlight of the joint 2018 KWI-PGI Christmas message, namely the importance of defending human rights as the main characteristic of humanitarian defenders. Human rights are inherent basic rights that God bestows on every-one. When upheld, human rights drive people to live humanely. Christmas wisdom is God’s order for mankind to defend humanity and human rights. That’s why in welcoming Christmas this year, the KWI-PGI invites all Christians to thank God for giving them a nation that promotes human rights. Despite the imperfections, the government deserves due credit for taking human rights seriously. Past gross human rights violations have not been completely resolved until today. As the KWI-PGI acknowledges, we are concerned about human rights violations that remain rampant in a number of places. For example, the right to a proper life in the economic, social and cultural fields related to security and comfort of life is denied in some regions. Threats, destruction and closure of houses of worship and the joint ministerial decree on the procedure to build a house of worship remain barriers to freedom of religion. Worse still, the freedoms of speech and expression have been confused by the rise of hate speech and hoaxes that often involve use of violence both physically and psychologically. The KWI-PGI underlines the problem of over-exploitation of nature and land sales transactions that still harm certain communities. Called for in the 2018 Christmas message, the ecological right to enjoy a healthy environment has not even been fully felt because of water, soil and air pollution. Those are all forms of human rights violations, in this country that must be resolved completely sooner rather than later. For this reason wisdom holds the key. We are grateful that one of the precepts of Pancasila was formulated in the context of wisdom through deliberation and representation. That is what is called for in the fourth principle of Pancasila, which calls for a "Democracy that is led by the wisdom of the representative of the People". 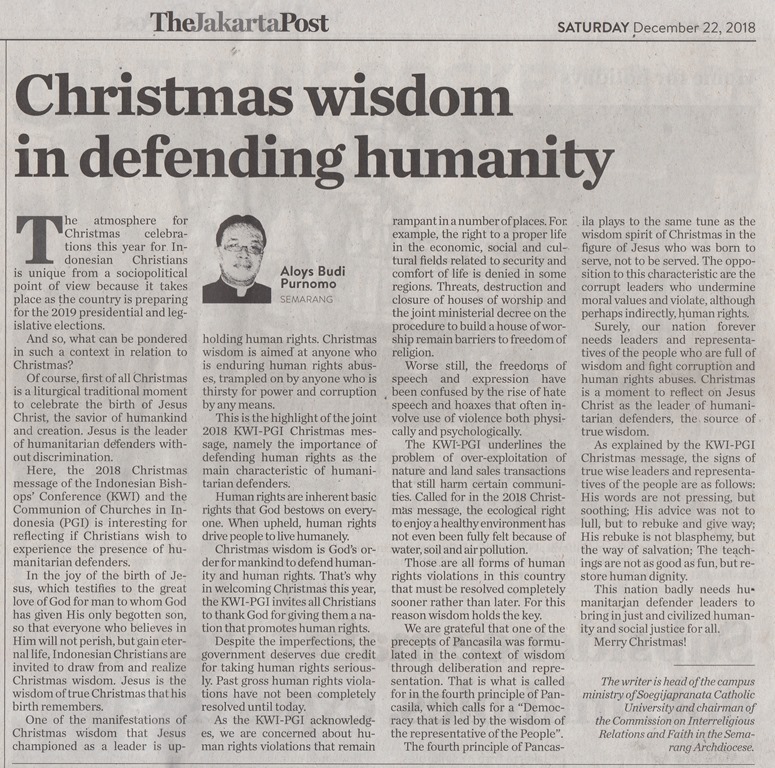 The fourth principle of Pancasila plays to the same tune as the wisdom spirit of Christmas in the figure of Jesus who was born to serve, not to be served. The opposition to this characteristic are the corrupt leaders who undermine moral values and violate, although perhaps indirectly, human rights. Surely, our nation forever needs leaders and representatives of the people who are full of wisdom and fight corruption and human rights abuses. Christmas is a moment to reflect on Jesus Christ as the leader, of humanitarian defenders, the source of true wisdom. As explained by the KWI-PGI Christmas message, the signs of true wise leaders and representatives of the people are as follows: His words are not pressing, but soothing; His advice was not to lull, but to rebuke and give way; His rebuke is not blasphemy, but the way of salvation; The teachings are not as good as fun, but restore human dignity. This nation badly needs humanitarian defender leaders to bring in just and civilized humanity and social justice for all. The writer is head of the campus ministry of Soegijapranata Catholic University and chairman of the Commission on Interreligious Relations and d Faith in the Semarang Archdiocese.